Who wouldn’t love her? She is green in the summer, even in a drought. She can grow up to 2 inches a day. Her leaves are a rich green color with a striking white central vein, and in the fall they turn a pretty red-bronze color. As impressive or even more so than the above ground growth is her roots. They commonly extend deeper than a man is tall and even grow through dense soil layers, such as claypans, that are impenetrable to many plant roots. This allows her to access water and cycle nutrients that most plants cannot reach. Her roots also have a unique ability to withstand waterlogged soils; air passages, called aerenchyma, allow her to transport air from above ground into her roots 1. Moreover, her roots can also be colonized by arbuscular mycorrhizae 1; association with this group of fungi commonly benefits plants by improving plant establishment and acquiring water and nutrients, especially phosphorus, for the plant. She shows good tolerance to acidity and aluminum toxicity 1. To add to her list of beauties, she forms associations with nitrogen fixing bacteria that give her “free nitrogen fertilizer” in exchange for food 2; this is more commonly thought of with plants in the legume family. To the rancher, she is also known as the ice cream grass due to being highly palatable and nutritious as well as being quite productive. To the wildlife enthusiast, the large stature of the plant lends itself to providing protective cover, and the nutritious leaves contribute to the diets of many critters from bison to the golden byssus butterfly. 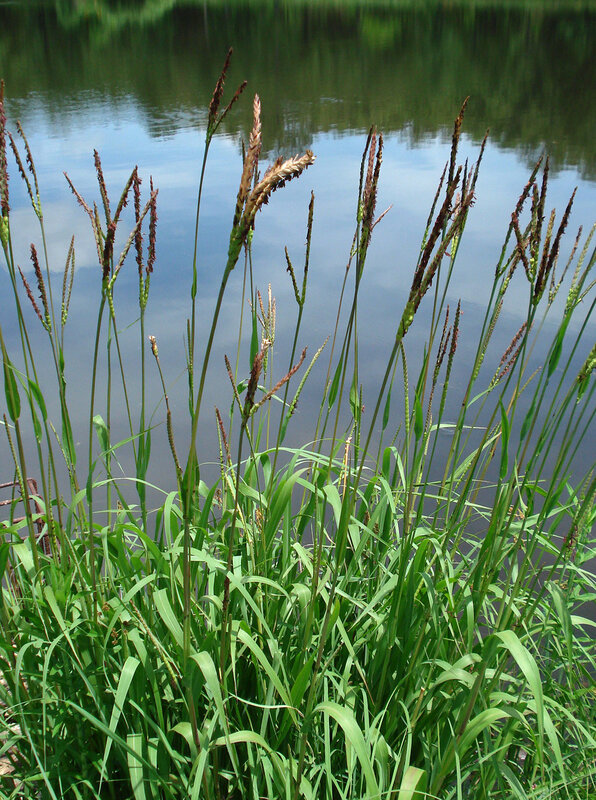 To the person wanting to reestablish a native prairie or savanna, what could be a more natural part of these ecosystems than this widely adaptable grass? And, to the landscaper, the spikey look of this plant can add interest as an accent plant or a substitute for a small shrub. “Who,” you ask, “is this Queen of the Grasses?” She is none other than the illustrious Eastern Gamagrass (Tripsacum dactyloides). And, with a list of qualities like this, why not plant this beauty everywhere? Surely we can improve our lives with just this one grass! And we can improve the lives of our livestock and wildlife not to mention the soil health! But if we plant only this one magnificent grass, who will grow during the cooler months of fall, winter, and spring? Not she. Who will have short roots to take advantage of a small summer rain? Not she. Who will provide nectar and pollen for the pollinators? Not she. And, who will provide for the health of the soil microbes during the cooler months? Not she. Should we then dethrone her and omit her from the planting because she cannot provide everything? By no means; she has a unique and indeed impressive set of qualities! How then shall we deal with this situation? Diversity! No one plant can provide everything. Each plant has its own unique set of characteristics that allow it to contribute to the whole. The ancient philosopher, Aristotle said, “The whole is greater than the sum of its parts.” It indeed seems to be this way with plants. One plant is great, but a diversity of plants all growing together is greater. Soil health students know that diversity is greater as it is the first principle of soil health 3. To the rancher, diversity mixed up within the same field provides the highest quality and quantity of forage possible on a year-round basis. To the wildlife enthusiast, diversity provides for all of the unique and sometimes picky wildlife species. To the restorationist, it is not a true restoration without striving to reestablish the diversity that was once found there. And, to the landscaper, well, it could be said that variety is the spice of life. So, no matter who you are, choose diversity. Appreciate each plant for its beauty, but do not believe that it is necessarily the only or best plant for your purpose. 1 Much interesting research about Eastern Gamagrass roots was done by Clark et al. and published in the article “Eastern Gamagrass Root Penetration into and Chemical Properties of Claypan Soils” in 1998 in the journal Plant & Soil. 2 Associative nitrogen fixation was reported by Brejda et al. in the Journal of Range Management article, “Indications of Associative Nitrogen Fixation in Eastern Gamagrass” in 1994. 3 The Soil Health Key Points Fact Sheet by NRCS may be found at https://www.nrcs.usda.gov/wps/portal/nrcs/detailfull/national/soils/health/?cid=stelprdb1049236 .